The winter can feel like a never ending season of chills and trying to keep warm. 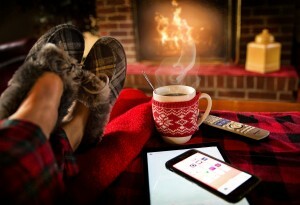 Turn your home into your ideal winter retreat with these cozy tips. Your bed should be a space where you feel warm, comfortable, and welcome because it can significantly affect your sleep. Beyond that, your bed should also be inviting because who doesn't love to sleep in a little on the weekends, especially when it's chilly outside? One quick way to make your bed more warm and inviting is to swap out your current sheets for some flannel sheets. This material will stay warmer, making getting into bed and staying there more comfortable. Throw a cozy quilt, and chunky knit blanket, and some soft cushions on top of it all to make it that much more cozy. Weighted blankets are also a great option that can make things even more toasty. If you're lucky enough to have a fireplace in your home, the winter is the perfect time to let it shine. Lighting a fire can make the whole room warmer while also giving it a more cozy cabin feel. Before you start a fire, however, be sure your fireplace is ready for use. If you haven't used your fireplace in a while or if it hasn't been cleaned since last year, definitely get it cleaned first. Creosote buildup and other debris can cause your fire to burn out of control. You can clean the fireplace yourself or you can hire a cleaning service to do it for you. Once it's ready to go, don't forget to put a screen in front of the fire to protect yourself and your flooring from flying embers. Heated floors are perfect for the winter, but if this isn't a reality in your home, there are other ways to achieve warmer floors. Wall-to-wall carpeting can make a home cozier because it's soft to the touch and it also helps insulate your home. This means your home will have less trouble staying warm in winter. If you don't have carpet, your tile or hardwood floors may make your home feel colder and less inviting. To combat this, invest in area rugs that can change up your space. You don't even have to use these year round, just lay them out during the winter so that your home feels and looks warmer. If your home has wall-to-wall carpeting, it can have a much cozier feel than other types of flooring. However, to keep it cozy and inviting, you'll need to get professional carpet cleanings at least once a year. To schedule your next professional carpet cleaning in TARGET, contact Fairbanks Cleanpro at (907) 388- 7768 today! It's not uncommon for home's to lose a lot of their heat during the winter through the windows. Even if your windows are shut, heat can escape if you're not careful. Because of this, it's important that you invest in some sturdy drapes for the winter. Keeping your heavy drapes closed at night can help the heat stay in your home while also helping to keep the cold outdoors. During the day, open the drapes and let some natural sunlight in to warm up the space and to give it a warmer glow. There are tons of tiny details you can use to make your home more cozy overall. For starters, take a look a the light your lightbulbs produce. Invest in bulbs that produce a warmer, softer light that can set the mood. Candlelight also gives off more cozy vibes that are easy to achieve. Look for winter scents that will not only change the lighting but also give your home a yummy winter fragrance. If you have pets or small children, electronic candles are the perfect option. Throws, knit blankets, and soft cushions are the perfect cozy accent for any space. Add some to your living room furniture for instant cozy vibes. Keeping your home inviting also means keeping it clean and tidy. For help keeping your carpet at its absolute best, contact the carpet cleaning pros at Fairbanks Cleanpro. Give them a call at (907) 388-7768 to schedule your next carpet cleaning. You can also ask about their upholstery cleaning services to keep your entire home looking and smelling great!